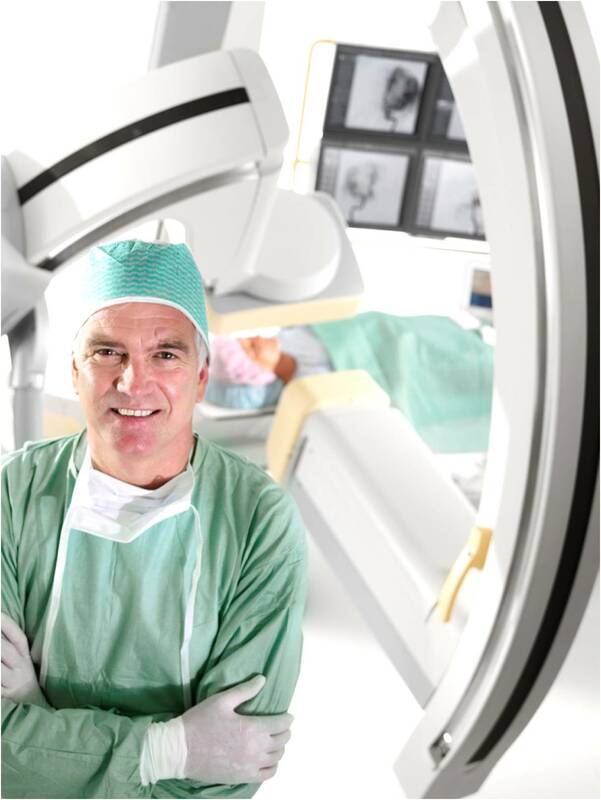 Interventional Radiology is a medical speciality that uses the various imaging and scanning facilities available to offer a range of minimally invasive procedures which in many cases can replace conventional open surgery. Most of the procedures use fluoroscopy and/or ultrasound, done under local anaesthetic and can be done either as day case procedures or require only a very short hospital stay with rapid return to normal activities. Advances in diagnostic imaging allowed the development of Interventional Radiology as a speciality from the mid 1970s. Advances in scanning and medical device technologies over recent years have seen a huge increase in the scope and ability of Interventional Radiology to treat a wide variety of conditions. These range from angioplasty and stenting of narrowed arteries to treating tumours by embolisation or blocking the blood supply. The speciality is at the cutting edge of application of new technologies to treat disease conditions that in the past may have required major surgical procedures with prolonged recovery times. Peripheral Vascular Disease – Treating narrowings in leg arteries – intermittent claudication. Renovascular intervention – Treating narrowings in the renal arteries to the kidneys. Emergency embolisation – To stop bleeding e.g. in trauma, Gastro-intestinal bleeding etc. Bronchial Embolisation – Heartlands Hospital houses the regional thoracic unit and adult cystic fibrosis unit and interventional radiologists provide a bronchial embolisation service for haemoptysis. EVAR (Endovascular aneurysm repair) – The interventional radiology department works closely with the vascular team to deliver a programme of endovascular stent graft for abdominal aortic aneurysms (AAA). Fibroid Embolisation (Uterine Artery Embolisation) – Heartlands Hospital was one of the first hospitals in the UK to offer cutting edge treatment for fibroids and has been the leading contributor to the UK fibroid Embolisation registry. This service has been running since 2000 and is performed by two highly specialised interventional radiologists. For many women UAE can be an alternative to hysterectomy and can enable them to keep fertility options open. Pelvic Congestion Syndrome Treatment – Pelvic Congestion Syndrome is a term describing pelvic pain symptoms related to pelvic varicose veins. These dilated veins are similar to varicose veins in the legs but occur deep in the pelvis. Vein embolisation can be done as a day case procedure. Varicocele Embolisation – A Varicocele is the presence of varicose veins around the testicle which may present as a scrotal swelling. They may cause discomfort or may be associated with sub-fertility. Varicoceles can be treated either by traditional open surgery or by interventional radiologists as a day case minimally invasive embolisation procedure. Vascular Access and Dialysis Intervention – Patients undergoing dialysis treatment and receiving regular drugs such as chemotherapy or long term antibiotics often require in-dwelling lines or catheters placed in a vein through which the medications can be given. Interventional radiologists place a wide range of lines and ports e.g. Hickman lines or PICC lines for these purposes. Embolisation – Tumours, including those which are inoperable, can sometimes be treated by embolisation, a minimally invasive x-ray guided procedure that blocks the blood supply to the tumour using a variety of agents, e.g. coils, particles, foam or glue. Radiofrequency ablation (RFA) and Microwave ablation – These are a non invasive treatment done under CT guidance for suitable tumours in the liver, kidneys and lungs. Interventional Uroradiology – Uses ultrasound or X-rays to guide treatments which often previously needed surgery. Examples include obtaining samples of tissue (biopsy) unblocking kidneys (Nephrostomy), removing kidney stones (Percutaneuos Nephrolithotomy – PCNL) and treating suitable kidney tumours with high frequency energy (Radiofrequency Ablation – RFA). Hepato-biliary Intervention – Includes Biopsies and drainages, Hepatobiliary interventions, Embolisations, GI bleed management, GI tract stenting for strictures. Facet joint injections – For pain relief. Vertebroplasty – Minimally invasive procedure which injects bone cement into collapsed vertebral bodies as a treatment for osteoporotic compression fractures.